Photos will appear when puppies are available. Photos will appear when puppies are available. Photos will appear when puppies are available. Because our re-homing process is eight (8) weeks, you can choose from one of our two (2) payment options available to you for your convince. See details below. Customer pays a deposit of 50 (%) percent of the purchase price plus 100% of the taxes. An additional 2% transaction fee will be added if the deposit is made by PayPal or credit card. (see acceptable forms of payment below). The remainder 50% (cash only) balance is due when puppy is picked up to be re-homed. If a customer paid the waiting list fee of $100.00, they will receive a credit on their final payment (this only applies to our perefered option one selection). is due when you secure a pick of the litter. The second payment is due on viewing date (or when you view puppy). The last payment is due on pick up date (when puppy is ready to be re-homed). If a customer paid the waiting list fee of $100.00 and chooses to select payment option two, they will not receive a $100.00 credit on their final payment. We do not accept personal checks. Our preferred form of payment is cash. However, if cash is not available, we will accept secondary forms of payment options for deposits – PayPal credit card, debit card, Wire Transfer (Western Union, Money Gram) Cashier’s Check, and Money Order. ALL PRICES HAVE SALES TAX ALREADY INCLUDED. Our prices may vary and are usually set at the time a litter is born. Prices for first our generation already included sales tax and transaction fees. A required deposit can be up to 50% of the purchase price and will be listed below as one of the PayPal payment options. (Making a payment using PayPal is not the only method. However due to our first come first serve policy, it is the fastest means to securing a pick of a current litter.) Included in our sales price is our re-homing and starter package, which includes a puppy, current vaccinations and CKC registration. 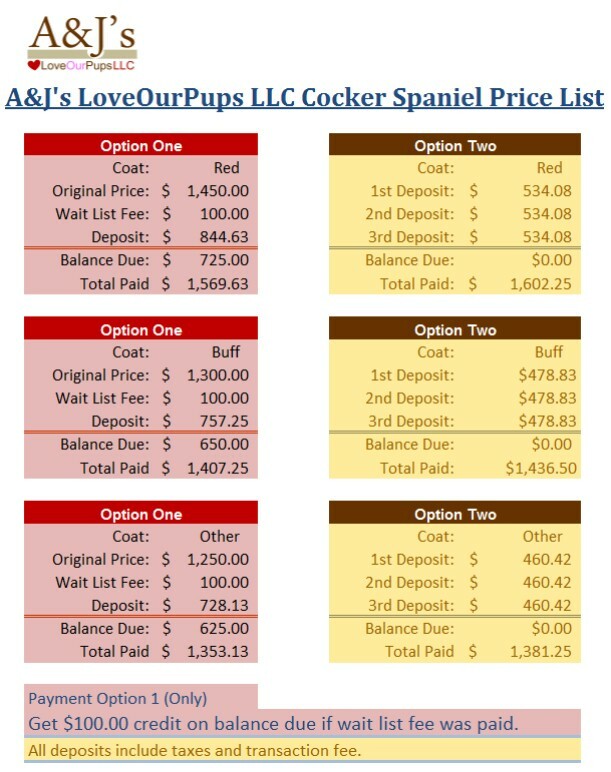 When buyer reserves his/her puppy with us, the buyer will be able to schedule an appointment to visit the chosen puppy. We cannot hold a puppy beyond the agreed upon appointment date and buyer will forfeit deposit. The “Purchase Commitment” non-refundable deposit could be as much as 50% of purchase price. Payment Options: We do not accept personal checks. Acceptable forms of payment are - Paypal, Credit Card, Debit Card (transaction charge will be added), Western Union, Money Gram, Cashier’s Check or Money Order in overnight delivery to us. Since most regular mail can be slow, it is recommended to send a reservation deposit via Priority Mail or UPS. When buyers reserve puppies with us we take it seriously, and all other interested parties are then turned away from the buyer’s reserved puppy. Deposits, as well as any additional funds, will not be refunded if buyer changes his/her mind for ANY reason. For an example: If the puppy’s full purchase price has been paid and purchaser decides that the puppy is not going to work for him/her for any reason, the full purchase price will NOT be refunded or transferred to a different puppy unless agreed to specifically by the breeder. If for some reason the puppy becomes fatally ill or dies prior to re-homing, your deposit reservation fee will be transferred to another available puppy of equal value. If there are no puppies available or not enough puppies in the current litter, you will be given the choice to pick from next litter or a future litter of equal value. If the puppy's value exceeds previous litter’s value, the remaining balance is due to the Seller by or before the puppy is 8 weeks of age. There will be additional charges if puppy is not picked up on the date determined that the puppy is ready to go to your home. 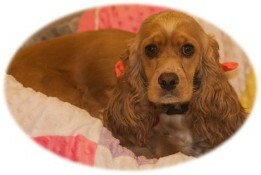 We will charge a Boarding fee of $30.00 per day. Additional vaccinations or treatments during the boarding period will be charged to buyer. For our customers who are out-of-state, we now offer a safe way to transport puppies nationally at the buyer’s expense. Shipping cost is not included in the price of the puppy (such as airfare, FDA required vet exam, health certificate for flight, airline approved carrier, gas, miles, time to/from airport and airport parking). When we began breeding designer puppies, we decided that we would not ship until we did our research and were comfortable that we could provide our customers a way to transport our puppies safely and humane, keeping their health and comfort in mind during the duration of the trip. After years of research in this area, we have tested and proven a method by going through the process for ourselves anonymously and were very pleased with the condition in which we have received our pets and the attention they have received from the airlines. Even though the puppies travel in the cargo area, it is pressurized at the same temperature as the passengers and receive the same air filter. In addition, the puppies are shipped in an airline-approved safety crate with food, water and are accompanied by seller’s documentation. Our first preference is still for our customers to come and pick-up in person. However, for those who consider this to be way too costly or simply not possible, we now offer an alternative. Please note that during the months where temperatures exceed 85 degrees, shipping will not be available. Our price for shipping (in US) is $400.00. PLEASE CONTACT US BY PHONE BEFORE PLACING A DEPOSIT PAYMENT. WE WILL NOT ACCEPT MONEY UNTIL WE HAVE A CONFIRMED LITTER.